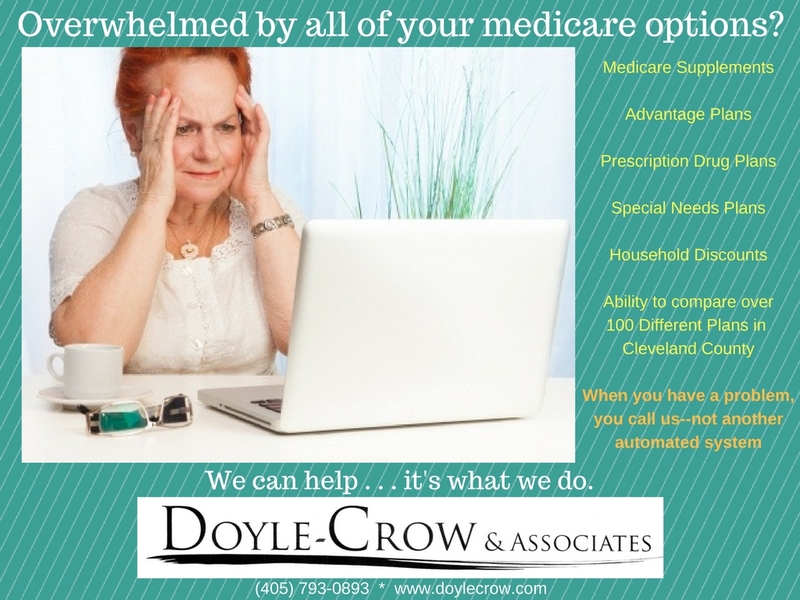 Doyle-Crow & Associates now has the ability to shop and compare over 100 different Senior Benefit Plans available in Cleveland County. We can compare Medicare Supplements, Medicare Advantage Plans, and Medicare Prescription Drug Plans to come up with the best choice that meets your needs and budget. We can enter all of your prescriptions, doctors, and hospitals in our system and generate a custom comparison showing you what each option will cost you on a yearly and monthly basis. Since we are appointed with many different carriers, you aren’t stuck trying to figure everything out on your own. We can help . . . it’s what we do. It’s not just a motto, we live by it. Call us at (405) 793-0893 and Doyle-Crow & Associates can help make your important decisions easier to understand. There is never an Obligation to purchase anything from us and we never charge our seniors a fee to help them out.